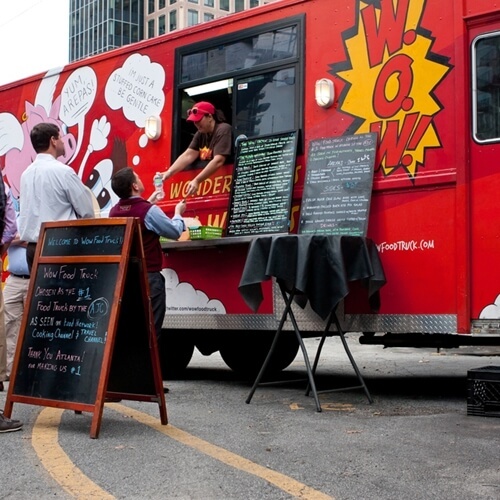 Normally, you have to be on dry land in order to enjoy the delicacies that a food truck has to offer. But now, you may be able to order from a food truck at sea. Royal Caribbean Cruises is planning on launching a food truck in November on the debut of its newest ship – Quantum of the Seas. Patrons aboard this ship will have the option to dine at the SeaPlex Dog House, where they can munch on complimentary hot dogs and sausages. The menu at SeaPlex Dog House spans the globe in origin and flavor. Whether you’re used to a New York hot dog or a Chicago-style dog, you can find what you’re looking for at this food truck. Choose from “The Sicilian,” “The Coney Island” or “The Wunderdog,” which is made up of 100 percent veal. Don’t forget to order a fresh salad to go with your hot dog piled high with toppings and condiments. The Royal Caribbean’s Quantum ship aims to reinvent the culinary atmosphere at sea. Instead of the traditional main dining room where guests eat, there will be more versatile options available. Patrons aboard the ship will have to decide between five primary restaurants and 13 smaller eateries, one of which includes the SeaPlex Dog House. This new way of eating out is being called “Dynamic Dining.” Guests will no longer have to choose between the two dining times of 6 and 8 p.m. Instead, they can choose exactly when and where they would like to eat every morning, afternoon and evening. The American Icon Grill, Chic, Silk, The Grande and Coastal Kitchen are the five establishments that will be available to patrons on the cruise ship. The cuisine at these restaurants range from New England comfort foods to Pan-Asian fare and California-influenced cuisine. Culinary courses online can help you create dishes that span a variety of cultures and tastes. Guests on the ship can even book reservations for any of the restaurants using the digital OpenTable smartphone application. When people aren’t dining on gourmet hot dogs, they can shoot hoops on the basketball court, ride in bumper cars, go roller skating or attend circus school – one of the ship’s newest amenities. The only problem that is being for​eseen is that this food truck culture won’t be anything new to the people aboard the ship. Quantum’s home port is in Bayonne, N. J., where food trucks are a common sight and frequented dining experience.